2Lt Vernon B. Newman (CP) - Flew first 4 missions with other Pilots. Upgraded from CoPilot to Pilot on 06 October 1944 and flew his final missions as a 1st Pilot. 2Lt Charles F. Scholz (N) - Flew five missions with the Hamilton Crew. Last 303rd mission on 08 July 1944. Crew then flew with other Navigators. 2Lt Charles Ziesche (B) - Flew 15 missions with the Hamilton crew. Last 303rd mission on 24 August 1944. Crew then flew with other Bombardiers or Toggliers. Sgt John D. Privette (WG) - Flew one mission with the Hamilton crew on 06 July 1944. Deleted from crew when crew size was changed from ten to nine men by eliminating one of the two Waist Gunner positions. 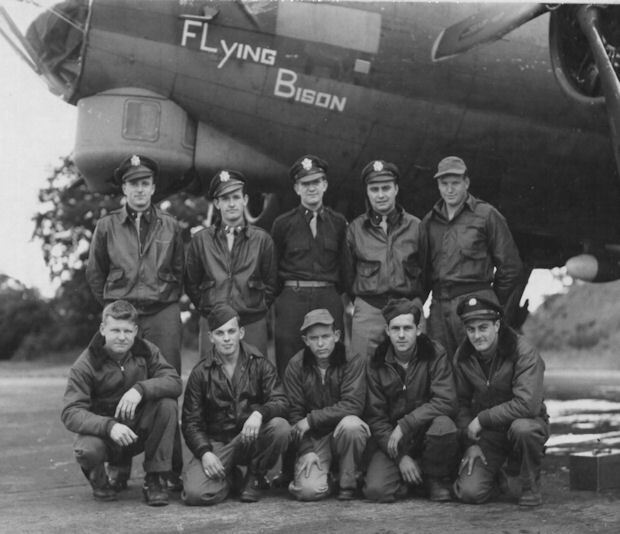 Was reassigned to the 449th BS (M)/322rd BG(M) flying in B-26 twin-engine bombers with the 9th Air Force at Beauvais/Tille, France. S/Sgt Charlie Barnes (E/WG) - Crew position changed from Engineer to to Waist Gunner, after 20 missions, on 28 September 1944.